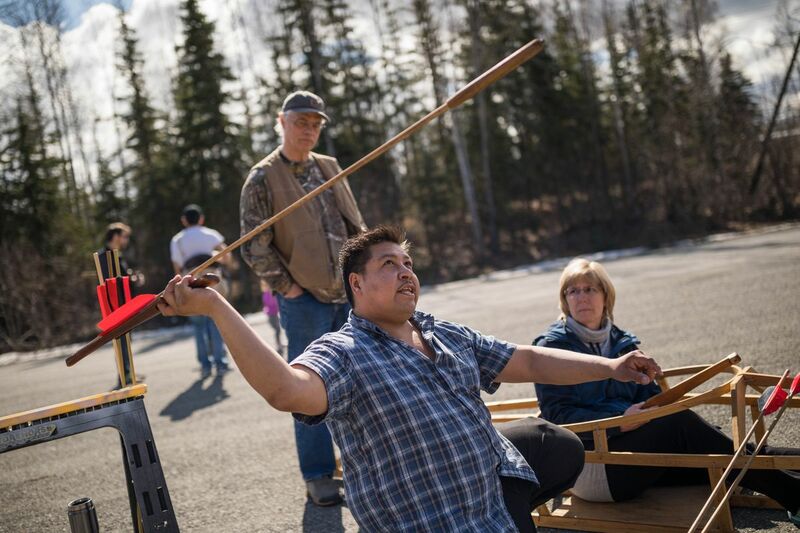 The purpose of Saturday's annual Alaska Atlatl Fun and Throw was not lost on 7-year-old David Schreyer. 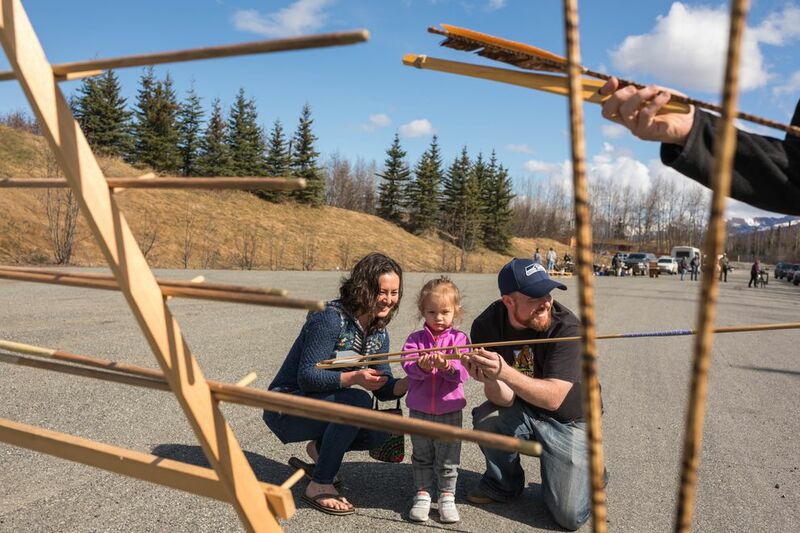 He and his dad spent the afternoon at the Alaska Native Heritage Center, where a parking lot was turned into a hunting range designed to show how the atlatl – an ancient hunting tool — helped some of Alaska's earliest occupants provide for themselves. Six stations were set up, each with a target, several spear-length darts and an assortment of atlatls, which are levering devices that hurl darts longer and farther than hand-thrown spears. Schreyer went from station to station with a scoresheet to record his success. "Probly the hardest part is getting ready," he said as he tried to affix a dart to an atlatl. An atlatl (pronounced at-laddle) is a wooden stick about 18 inches long with a handgrip on one end and a spur, or hook, on the other. A socket on the end of the dart goes on the spur, but putting it there and keeping it there is a job for steady hands, sort of like threading a needle. Imagine how hard that task would be if you were hunting in extreme cold or wind or rain, someone said. "And you need food," Schreyer added. Observations like Schreyer's were exactly the point of Saturday's event. For 18 years, Alaska state archaeologist Richard VanderHoek has organized the event to entice people to step back in time and experience the ingenuity that allowed our ancestors to survive. "As archaeologists we try to interest people in the past and how things were done in the past," he said. "A hands-on activity that simulates hunting and catches people's fancy is a good way to get people thinking about the past." The atlatl is one of VanderHoek's pet topics. His interest stretches back to when he was a kid. A 1973 graduate of Service High, VanderHoek convinced one of his high school teachers to OK an independent study project on traditional weapons, for which he built two atlatls. Also called a throwing board or a nuqaq, the atlatl dates back to the Ice Age and is believed to have been used 20,000 years ago in some parts of the world and as many as 15,000 years ago in Alaska, VanderHoek said. The atlatl was a precurser to the bow and arrow. And while that makes it prehistoric, don't assume that makes it primitive, VanderHoek said. "Please don't call this primitive technology," he said. "This is as high-tech as the tools available allowed. 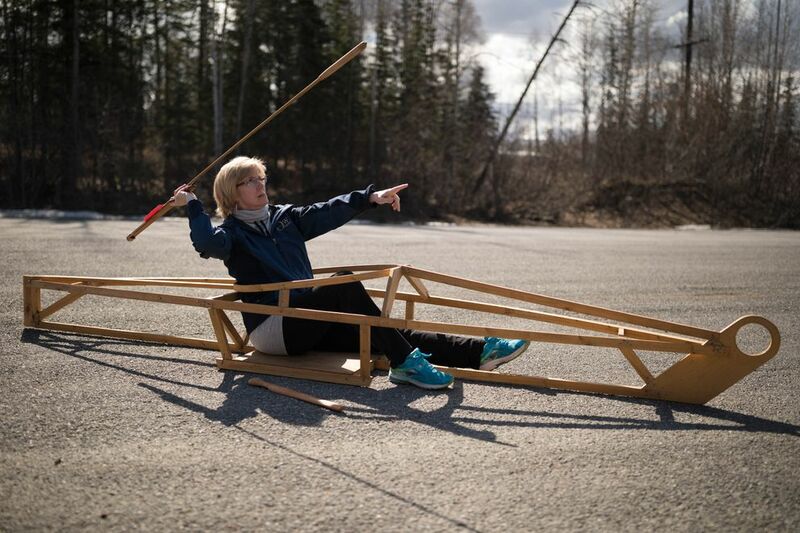 The people of the Arctic have some of the highest examples of (ingenuity) in history. They made the most refined tools they could." VanderHoek's annual demonstration displays its own kind of inventiveness. It uses targets that are clever and, in some cases, a little kooky. One is metal cut-out of a bison, one is a big piece of cardboard with a wild boar drawn on it and another is a vegetarian offering — a giant orange carrot drawn on a giant posterboard taped to cardboard and propped up by hay bales. 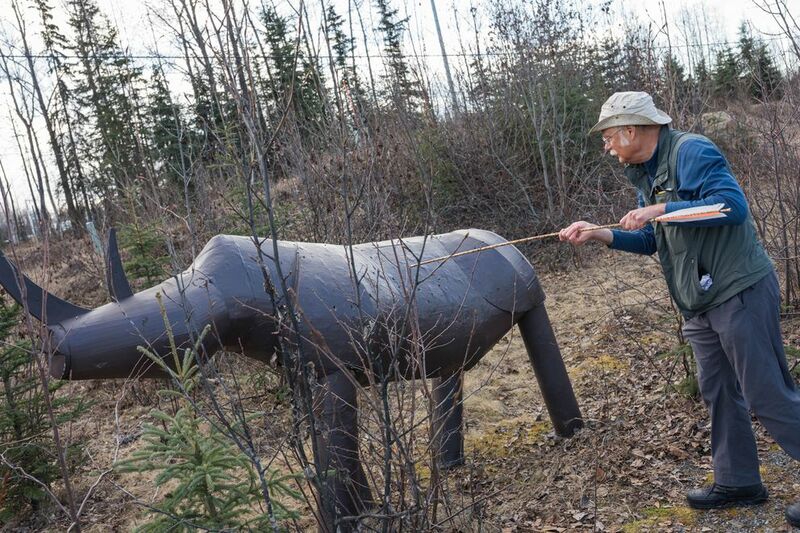 The most striking target is a nearly life-size rhinoceros, made by Toni Harsh and Wayne Robinson of Eagle River and inspired by the wooly rhino. It's painted gray and made from scrap wood, pieces of cardboard, spray foam, styrofoam, duct tape and, for the legs, sonotubes. The shell of a kayak was at one station. About 10 yards away on brown grass next to the parking lot was the target — a white balloon inside a hula hoop, representing the head of a seal bobbing out of the water. Kids and adults took turns hurling darts at the balloon, which survived the five-hour event. A handful of Alaska villages at the mouth of the Yukon River still use atlatls when hunting seals from kayaks, VanderHoek said. "The reason it's survived is because it's still a superior tool," he said. A steady stream of people came to Saturday's event, a loose affair with no lectures or interpretive panels. Moose sausage and brats cooked on a grill, VanderHoek mingled with visitors, and workers from the Alaska Native Heritage Center served as instructors at each station. During the summer when the center draws a lot of tourists, atlatl demonstrations happen with regularity, said Loren Anderson, the center's director of cultural and educational programs. "They love it because it takes the culture from behind the glass," he said. "You can experience it, you can try it. You get more of an appreciation of what people did to survive." Saturday's visitors included Sean Cardinal and his sons, 6-year-old Julian and 2-year-old Ronan. Julian launched dart after dart at the orange carrot while Ronan chattered about the balloon/seal as he sat on his dad's shoulders. Cardinal was impressed by the ancient innovation on display. "They figured it out before there was television and gun powder," he said. "I'm excited about building a couple of these and going camping with the boys and throwing them in the woods."